My Design 2 class which is one semester in length, is divided into two units. The dominant unit is Architecture which runs approximately 10 weeks. Within this unit we discuss architectural history, sustainable design, interior plan/flow, prefabrication, co-housing, new urbanism, and global housing needs. 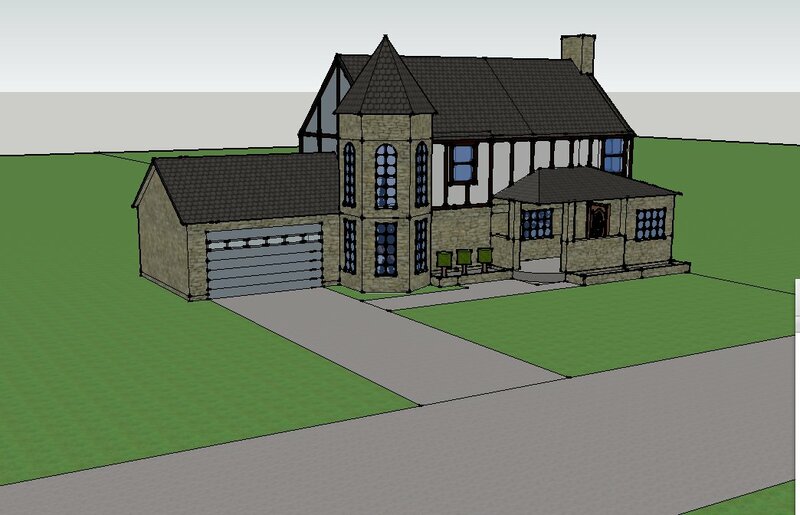 Over the years we have moved from hand drawing plans to 3-D Home Architect and are currently using Google Sketchup! We have had incredible opportunities to visit architecture firms for our critiques, have one-on -one critiques with visiting architects and tour historical homes. When I first began the program seven years ago, students hand drew plans (here is a video of their small group, student led critiques) (another video) and then built their homes with foam core and pins. 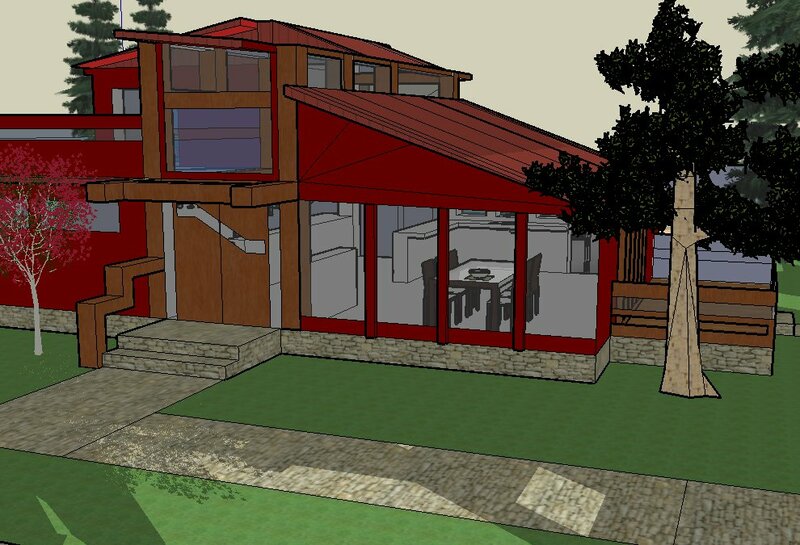 Since GoogleSketchup! 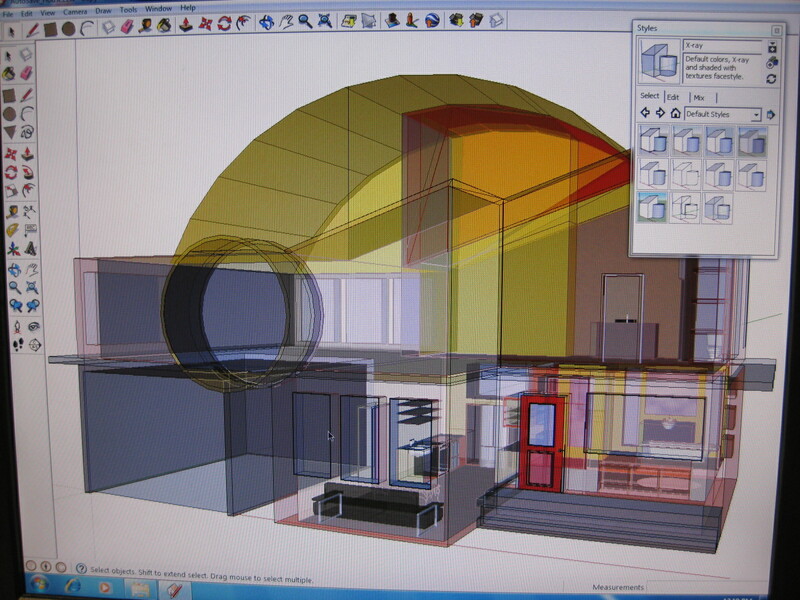 creates 3-D architectural designs, I have opted to not have students build their own house models. Trying to cultivate the learning styles of the kinesthetic learner I still have model building as a small part of the curriculum. This year we built scaled micro-housing units for Haiti’s earthquake relief, as a test run for a future course our school might offer in prefabricated units for Haiti. I am also interested in working with problem-solving engineering issues where the kinesthetic learner can be involved in scaled-model building. With the rise of over-sized and impersonal “Mc Mansions ” in the 90′s and the housing crisis of our present day economy, I wanted my architecture students to create their own home within the boundaries of 1250 sq ft. We began the architecture unit with a 2-day presentation of the history of architecture. We discussed the economic and social changes that impacted architectural design as well as the impact architecture has on social changes. Sustainable design, stewardship of materials and budget were also discussed. 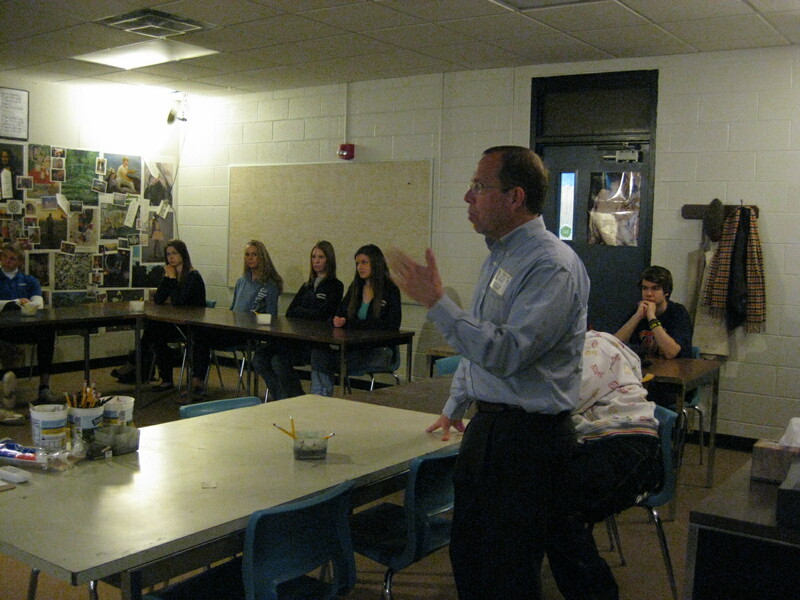 To begin, students evaluated their personal homes, considering the design pluses and minuses in each of the rooms. 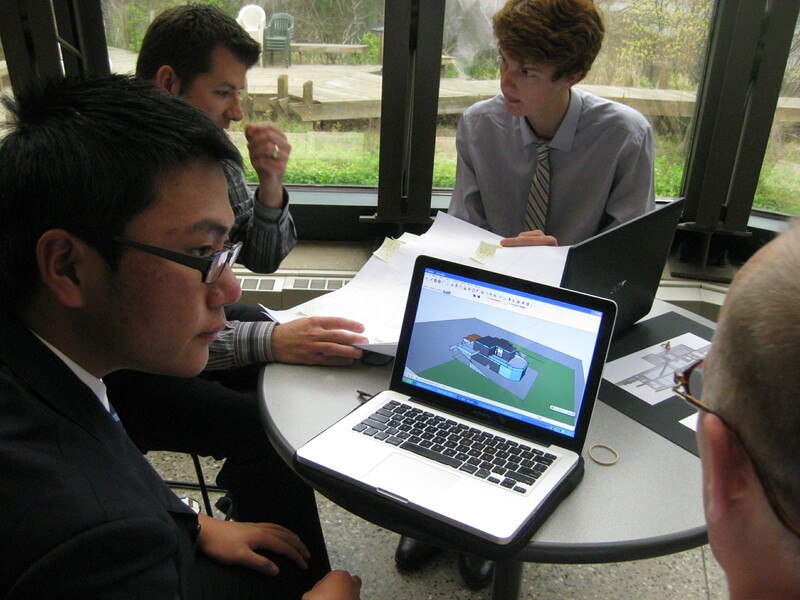 Students researched online current trends in architecture, micro-housing and prefabricated housing. We also spent 4 class periods on the interior floor plan of a home and proper flow of rooms. Pairs of students presented and evaluation a floor plan.with students presenting in pairs an evaluation of a floor plan. Before beginning design work students toured the Grand Rapids’ historic district and the Meyer May Home built by Frank Lloyd Wright. I believe that the 3 weeks we spent on the history of architecture and the issues of design were integral to the impressive and unique designs that my students created. Some students worked on a floor plan and then used Google Sketchup!to build from there. 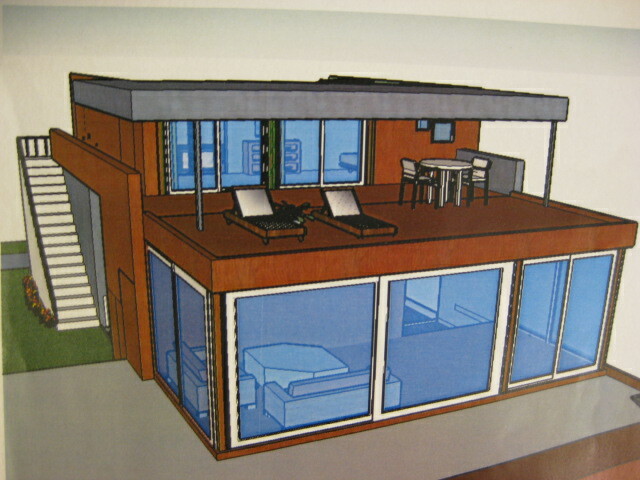 Others began with Google Sketchup! and worked out their floor plan as they went along. With both groups I encouraged a continual dialogue between the interior and the exterior. Two weeks into the design project guest architect, David Maxam of Maxam Architecture did a mid-way, one-on-one critique with my each of students. Students then worked another 3 weeks on the project, completing with both interior and exterior. I did not require all the furnishings to be placed (as our school server can not handle too many GoogleSketchup! downloads) but most students had either built their own furnishings and cabinets or had a basic layout of furnishings. Maxam participated in the final large group critique. Students had their final exam at Progressive Architecture and Engineering. The architecture firm has assisted us at least five times over the course of eight years in critiquing student work or giving tours. It was quite an exciting experience for some of my students, especially those eager to look into architecture as a career. Here is a short video clip. We had an article in the paper as well! Over the past few years I have had a deep desire to have my students create projects that help serve local and global communities. Serving others with their designs creates a very different dynamic in the classroom. It opens my students’ hearts to ethical issues that might be discussed and forces them as designers to problem-solve design issues not typically encountered in a generic classroom architectural project. I chose for my students to design prefabricated micro-housing units for Haiti’s displaced that would eventually be prefabricated by them at our school. The future hope of this project would be that these prefabricated units would be stacked flat in a shipping container to Hai ti. During Spring Break, or possibly early summer, students would then travel to Haiti and assist with putting the units together. 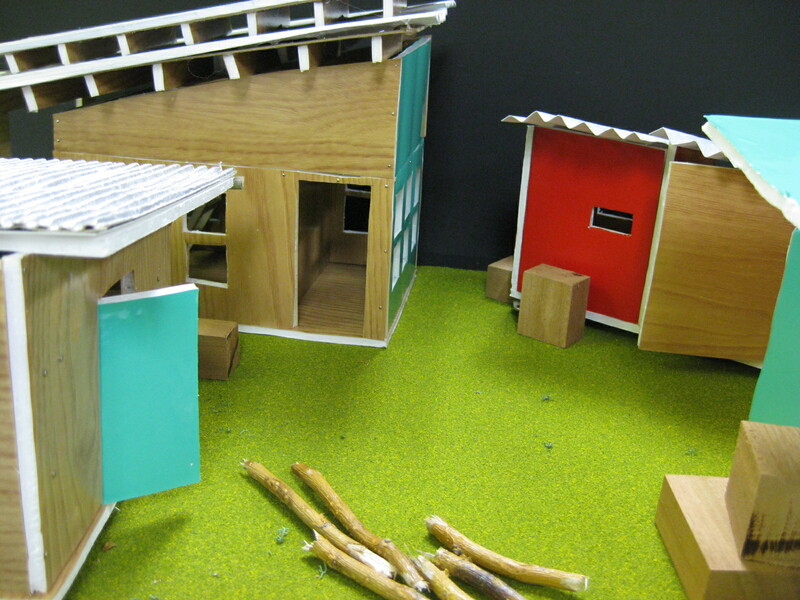 With the Haiti Micro-housing project there were a number of new considerations for my young designers. We had two guests come to the class and discuss a variety of issues. Pastor Eric Hausler, who has served in Haiti for over twenty years gave a slide presentation on the Haitian community and its needs since the 2010 catastrophic 7.0 magnitude earthquake. With over 650,000 still awaiting permanent housing (International Crisis Group, 2010), there is a huge need for micro-housing. Our second guest was designer and builder, Cameron Van Dyke who showed examples of micro-housing units, prefabricated houses, and shipping container homes. 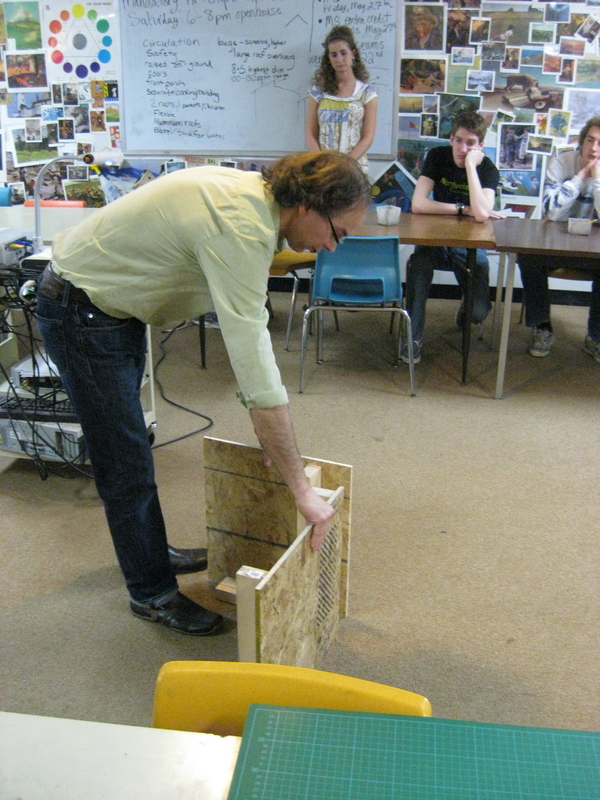 He also discussed building issues and gave a small demonstration on how the homes would eventually be prefabricated. Students could choose to work alone or with a partner. They began their design work learning about measuring with a scaled-rule. This in itself was a great learning experience! This was a two and a half week design and model-build project. Approximately 7 days of design and drawing to scale and 5 days of constructing. About 3 days into designing Van Dyke came in again to assess how the designs were coming and then both Hausler and Van Dyke returned for a final critique.